Looking for a romantic getaway near Louisville, Kentucky? Travel just a little further to Bourbon Manor, our bed and breakfast in Bardstown, KY, and enjoy some time away in our Sweet Old Fashioned Room. The Sweet Old Fashioned is a Bourbon Whiskey cocktail that was created in the late 1800s at the Pendennis Club in Louisville in honor of James E. Pepper, a well-known bourbon distiller in the area whose name is now on 1776 Bourbon. This classic, sweet drink is made by dissolving sugar in bitters, and then adding Bourbon and a twist of lemon – best served with ice. Because of its name and age, the Sweet Old Fashioned is known as a classic and somewhat romantic drink. 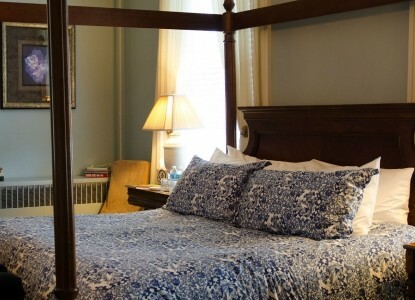 As the name implies, the spacious Sweet Old Fashioned guestroom is both elegant and charming and is a luxuriously relaxing ending to a busy day touring the Bourbon Trail and historic Bardstown. 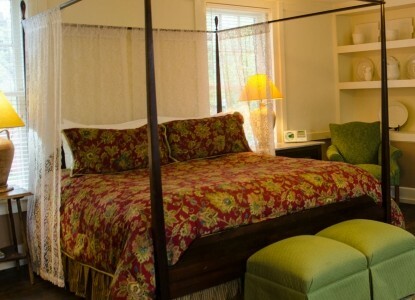 The 20’x20′ room features antique furnishings, and a king-size canopy bed with a plush 2″ mattress topper. Choose one of the room’s books to peruse as you relax in the comfortable couch and chairs. Fall asleep in complete comfort in the king-sized canopy bed with plush 2″ mattress topper and 600-thread-count linens as a fire flickers in the gas-log fireplace. Awaken to beautiful morning views of our graceful lawn with its ancient magnolia trees and beautiful flower gardens. An award-winning full country breakfast in our Dining Room between 8 a.m. and 10 a.m. will prepare you for your exploration of our many area attractions. Lodging for a perfect romantic weekend getaway in Bardstown, KY can be found in Bourbon Manor’ssumptuous Mint Julep Room. Any horse-racing enthusiast knows that the Mint Julep is the drink of tradition at the Kentucky Derby. It is made by muddling mint leaves in a bit of water, and then adding bourbon, sugar, and crushed or shaved ice. The drink traditionally creates a frost on the outside of the glass. The romance of its Kentucky history made this drink an obvious choice for one of our inviting rooms. This very quiet, private, and romantic Mint Julep guestroom features a beautiful antique armoire, a Jacuzzi tub for two with separate walk-in shower, and an electric fireplace. The windows open to views of the west lawn, Bourbon Barn, and a secret garden with its unique sculpture of a hand. Enjoy a content and comfortable sleep in the elegantly carved, four-poster king-size bed with premium hypo-allergenic featherbed and luxurious linens. Comfortable chairs invite you to enjoy a relaxing morning before joining us in the dining room for a delicious country breakfast. Of course, a weekend may not be enough time to explore the area and its attractions. With the Bourbon Trail, the Wine Trail, amazing outdoor destinations, and the area’s history and horse-related legacy, you may need to plan a longer stay in this luxurious room to create wonderful, lasting memories of your time here in Kentucky. Your luxurious Kentucky accommodations are right here in the Classic Sazerac Suite. 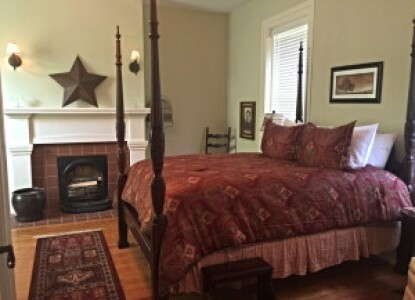 This large room features a beautiful four-poster king-size Bed with luxury linens, beautiful antiques, large flat screen TV with Cable, and a private bath featuring a walk-in shower and Thermal-Masseur jetted tub for a comfortable and relaxing Bourbon Manor lodging option. While not a local creation, the bourbon version of New Orleans’ Classic Sazerac has become a favorite drink here in Kentucky. The drink is made by crushing a sugar cube in a small amount of bitters before adding bourbon and a small amount of anise flavored alcohol (like absinthe), and served over ice. It is a sweet and indulgent drink. 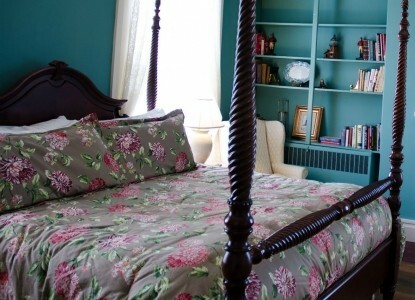 Similarly, the Classic Sazerac guestroom is a sweet and indulgent room! The bed features a hypo-allergenic featherbed topper and luxurious linens, antique dresser, sitting area with comfortable chairs, and an electric fireplace. Besides the tub, the private bathroom features a separate walk-in shower. Enjoy the Classic Sazerac room for relaxing, rekindling, and renewal during your getaway to beautiful Kentucky! Why settle for hotel rooms in a loud and brightly-lit city when Bourbon Manor offers elegant travel accommodations in the heart of Kentucky’s Bourbon Country? A favorite drink during the colder months, a Hot Toddy is traditionally made with hot Bourbon mixed with ginger ale, lemon, and honey. They say that a Hot Toddy is the cure for whatever ails you, and it’s the same for our Hotty Toddy guestroom! This spacious guestroom’s grand, four-poster king-size bed will take you far away from the normal stressors of life. The room features beautiful antiques, a couch, and views of the formal lawn with its flower gardens and ancient Magnolia trees. A premium, hypo-allergenic Fiberbed mattress with luxurious linens will soothe you into a comfortable sleep. The room’s private bath offers our high-end amenities and 2-person walk-in shower. Of course you will be treated to a delicious country breakfast on each morning of your stay! While Southern Love is a very specific drink featuring a Louisiana liqueur, we have taken the idea and given it a Kentucky twist by applying the name only to this very romantic guestroom. This restful retreat at our inn features a beautiful antique queen-size bed with luxurious high thread-count linens, premium hypo-allergenic feather topper, and gas-log fireplace. Outside the windows, views of the formal flower gardens, Bourbon Barn and patio area make this a bright and cheerful guestroom by day and a cozy, relaxing hideaway at night. A private bath offers a walk-in shower and all of our luxurious spa amenities. A full country breakfast is offered each morning of your stay to give you the energy needed to explore beautiful west-central KY and all its attractions. 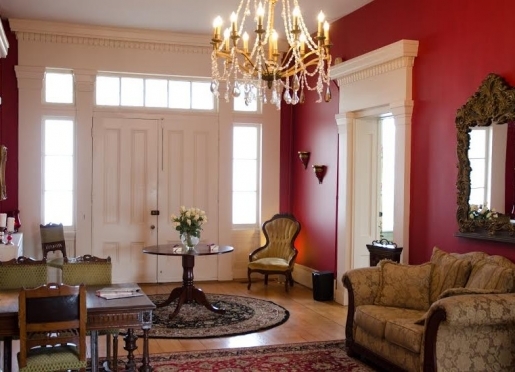 Rediscover romance in the Manhattan Honeymoon Hideaway at Bardstown Kentucky’s Bourbon Manor. Perfect for a honeymoon travel destination, our largest and most private guestroom suite features its very own exterior entrance, beautiful antiques, a king-size canopy bed, fireplace, and Jacuzzi for two. The Manhattan is a traditional drink made of bourbon, sweet vermouth, bitters, a cherry, and a twist of orange. As the name implies, it was created in Manhattan; however, Kentucky has made our own variation of this drink a tradition. Similarly, the Manhattan Honeymoon Hideaway is a traditional romantic setting for anyone celebrating a special occasion, offering both romance and relaxation on the inn’s second floor. The bed is topped with a hypo-allergenic featherbed and luxurious linens. The gas-log fireplace and designer lighting with dimmers sets a tranquil scene for a peaceful evening. Besides the Jacuzzi tub, the private bath also features a walk-in shower, a towel-warmer for ultimate comfort after bathing, and our deluxe spa amenities. The room offers its own beverage station with coffee maker, a mini-refrigerator, and a microwave oven for your convenience. This room also features its own dedicated parking space. PLEASE NOTE: This Guestroom is located on the second floor. To access the room, guests must go up a steep, narrow winding stairway. Please be advised to bring smaller luggage and not have issues with stairs. The Scarlet Starlet guestroom features a 7-layer Blissful, queen bed, antiques, large-screen TV with cable and FREE Movies, and private vintage bath – located on the first floor. 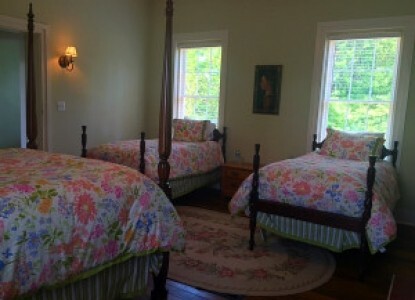 Upstairs, the Magnolia Maiden guestroom offers beautiful antiques and a queen-size bed. The Debutnate’s Dream guestroom features 1 queen bed and 2 twin beds – ideal for sharing! These guestrooms may be rented separtely or as a group. The Guest House is a favorite of the ladies for a girlfriends’ getaway when renting out the entire Guest House for an unforgettably, fun and festive weekend. Of course, the Guest House can be rented out for any occasion for up to 8 guests: Bachlorette or Bridal Party, a Bourbon Trail excursion for a group of friends, a family vacation base, or a small reunion. There is plenty to see and do in the area to keep you busy no matter how long you stay! For extra convenience, the Guest House is just a few steps away from the Manor where you can enjoy our complimentary beverages and full country gourmet breakfast each morning of your stay. The Magnolia Maiden guestroom offers beautiful antiques and a queen-size bed. Up to two people are welcome to stay in this pretty, elegant room. The Debutante’s Dream guestroom features 1 queen bed and 2 twin beds – ideal for sharing! There is also the Scarlet Starlit guestroom which features a queen bed on the first floor. Rooms may be rented separately or as a group. The Guest House is a favorite of the ladies for a girlfriends’ getaway when renting out the entire Guest House for an unforgettably, fun and festive weekend. 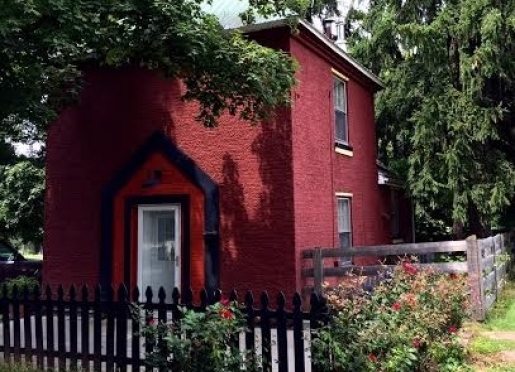 Of course, the Guest House can be rented out for any occasion for up to 8 guests: Bachelorette or Bridal Party, a Bourbon Trail excursion for a group of friends, a family vacation base, or a small reunion. There is plenty to see and do in the area to keep you busy no matter how long you stay! For extra convenience, the Guest House is just a few steps away from the Manor where you can enjoy our complimentary beverages and country gourmet breakfast each morning of your stay. 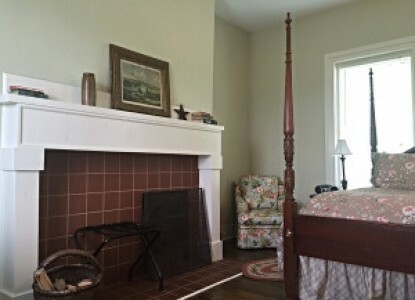 Take a step back in time and enjoy the plantation's original 2-story smokehouse cottage, which now is offered as a quaint one-bedroom king-bed guest rental. Exposed beams and bricks provide for a nostalgic setting. The den is accented with historic farm tools and bourbon-themed decor. It has a wood-burning fireplace, large flat screen TV, pull out queen-size sleeper sofa, and 2 chairs and coffee table. The kitchen is fully equipped and includes a stove and oven, full-size refrigerator, dishwater, and microwave oven, along with plates, utensils, and paper products. The first floor, private bath features a 2-person shower with rainfall shower head for an extra romantic touch. There is an abundance of modern updates including tiled marbled floors, ceiling fan, and light dimmers. 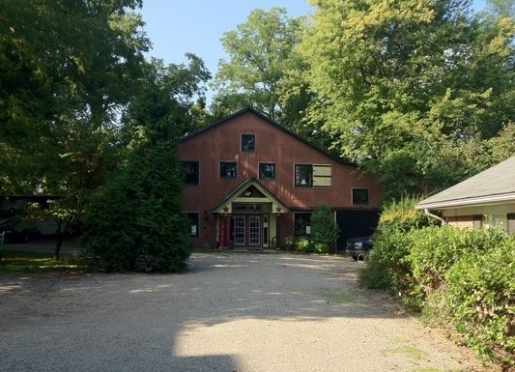 The small fenced yard and surrounding back lot provide open, private space to sit outside and enjoy a serene barn-yard setting featuring the old historic mill building. 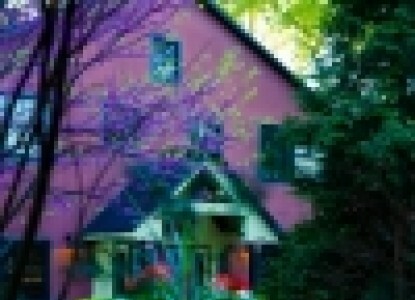 So whether you're searching for a very private romantic cottage or an extended stay arrangement (4+ Nights-$10 off the nightly rate), this is ideally suited for a couple, family, or business, travelers for truly unique cottage accommodations. May be rented with or without a breakfast option. Online rate includes the full country breakfast which is served in the formal dining room in the main house, daily between 8-10am. You may opt not to have breakfast and deduct $12.50/person from the nightly rate (MUST be pre-arranged). Call to adjust your breakfast selection: 502.350.1010. We want your time at Bourbon Manorbed and breakfast to be as memorable as possible. 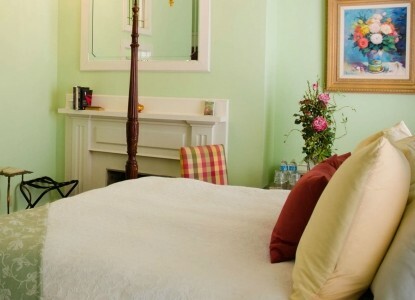 Our handsome Federal-style B&B in historic and beautiful Bardstown, Kentucky offers luxurious accommodations that are a perfect alternative to run-of-the-mill hotel rooms. Rates are based on Double Occupancy: For additional guests, add $35/person/night. Children and Pets CANNOT be accommodated. Smoking:NO SMOKING is allowed INSIDE the inn; smoking allowed OUTSIDE only. A $250 fee will be charged should there be any damages or lingering smoke as a result of a guest smoking anywhere inside the home. Candles:Prohibited – Sorry, but our fire alarms are very sensitive, our insurance prohibits candle use, and you will be responsible for all charges resulting in wax or fire damage clean-up. Consumption of alcohol is permitted:You are welcome to bring your own spirits with you, or we may provide for you through special add-ons or service from the Bourbon Bar & Lounge. Payment: Each guest is expected to agree to pay for any and all charges related to their stay at Bourbon Manor. 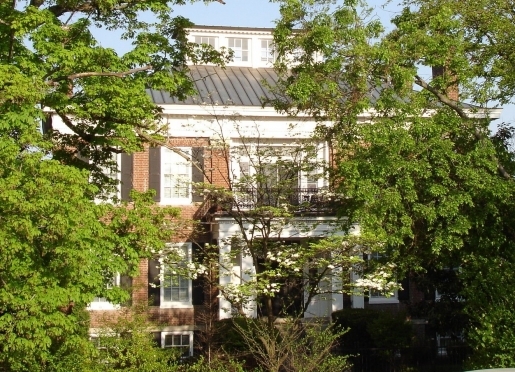 Owner’s Rights:Bourbon Manor is privately owned and operated. Management reserves the right to refuse service to anyone. We will not be responsible for guest accidents or injury, or for loss of money, jewelry, or valuables of any kind. Property Issues:Any damages, stolen items, or broken items occurring during the stay will be the full financial responsibility of the guest, including anyone traveling with the guest. Any special clean-up resulting in damages caused by the guests will be charged to the credit card provided at the time of reservation. Charges may need to be applied after the departure as deemed necessary by the Owner/Innkeeper. Accepted Payment Methods:Cash, Debit Cards, Discover, MasterCard, Visa, Amex, Personal Checks (subject to a $30 return check fee), Traveler’s Checks, and Gift Certificates. Deposit Required:50% of rental (minimum 1-night charge) is due by cash, check, money order, traveler’s check, or credit/debit card when your reservation is made. The balance is due at the end of your stay or rental agreement. You are responsible for the entire amount of your rental agreement. All payments are guaranteed by a valid Credit or Debit Card. Rates & Taxes:Subject to a 6% State Sales Tax, 1% Transient Room Tax, and 3% Tourism Tax. Prices may vary from outdated quotes on other websites, and from quotes involving holidays or festival weekends as we do not discount for holiday or festival periods. Gift Certificates/Gift Cards values are valid for one year for the amount of purchase. Minimum/Maximum Stay:No minimum stay required, unless otherwise noted. Check-inis between 4:00 p.m. – 9:00 p.m., Eastern Time. Check-out is between 11:00 a.m. – 12:00 p.m., Eastern Time. Early arrivals will be assessed a $50 fee for urgent and extra housekeeping preparations related to unexpected arrivals. Early arrivals must be pre-arranged and agreeable by the Innkeeper. Please no early drop-off of bags or in-room items. 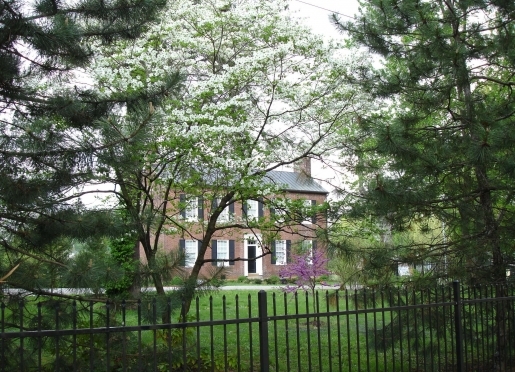 Drive-bys are permissible, but not for tours/history of the home, use of bathrooms, or other reasons for unexpected arrivals. Late arrivals after 9:00pm require advance notification and Key Arrangements to be provided. Please, no calls or unexpected arrivals after 11:00pm out of respect and courtesy of other house guests. Early Departures: Should you need to depart prior to your reservation end-date you will be expected to fulfill your full reservation commitment. Trip Cancellation Plan AVAILABLE (request when making reservation): If you have to cancel up to 12pm EST the day of your arrival, you receive a FULL REFUND of your DEPOSIT less a $25 Administration Fee. The cost of the plan is only 15% of your reserved room rate. Pre-payment of the full value of your reservation is required in advance for this plan using a Credit or Debit Card. 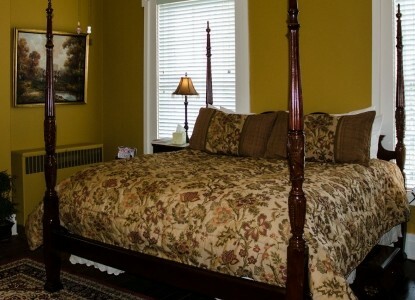 Thank you for making an inquiry about staying at Bourbon Manor Bed & Breakfast Inn.